Compare prices from multiple car hire suppliers in Lisbon to find the best available deal. A few of the car rental companies we compare include Gold Car, Budget, Avis, Hertz, Sixt and many more. Lisbon is the capital city of Portugal, as well as the largest city in the country. The city boasts a population of 545,245 inhabitants (2010) and sits on 84.4 square kilometers. Outside the city limits, there is a population of more than three million along 958 square kilometers. This makes it the ninth most populous urban area throughout the European Union. 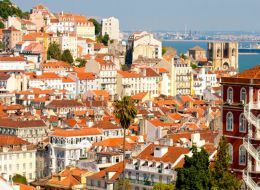 Lisbon is a recognized alpha city because of the importance it holds in entertainment, media, finance, commerce, tourism, and international trade. It is also one of the oldest cities in the world, predating capitals like Rome, Paris, and London. There are many things to see and do while in Lisbon, such as the Cristo Rei, Castelo de Sao Jorge, and the Ponte Vasco da Gama, which is the longest bridge in all of Europe. There is also a number of museums and galleries, including the Museu Nacional de Arte Antigua, Museu Coleccao Berardo, and Museu do Azulejo. The city of Lisbon is serviced by the Lisbon Portela Airport (LIS), and it is located around seven kilometers from the city. It is the primary airport for Portugal servicing over 14 million passengers annually. It is one of the largest airports throughout the souther region of Europe.